British railways had a head start on American railroads, with the first "bed-carriage" (an early sleeping car) being built there as early as 1838 for use on the London and Birmingham Railway and the Grand Junction Railway. Britain's early sleepers, when made up for sleeping, extended the foot of the bed into a boot section at the end of the carriage. The cars were still too short to allow more than two or three beds to be positioned end to end. Britain's Royal Mail commissioned and built the first Travelling Post Office cars in the late 1840s as well. These cars resembled coaches in their short wheelbase and exterior design, but were equipped with nets on the sides of the cars to catch mail bags while the train was in motion. American RPOs, first appearing in the 1860s, also featured equipment to catch mail bags at speed, but the American design more closely resembled a large hook that would catch the mailbag in its crook. When not in use, the hook would swivel down against the side of the car to prevent it from catching obstacles. As locomotive technology progressed in the mid-19th century, trains grew in length and weight. Passenger cars, particularly in America, grew along with them, first getting longer with the addition of a second truck (one at each end), and wider as their suspensions improved. Cars built for European use featured side door compartments, while American car design favored what was called a train coach, a single long cabin with rows of seats, with doors located at the ends of the car. Early American sleeping cars were not compartmented, but by the end of the 19th century they were. The compartments in the later sleepers were accessed from a side hall running the length of the cars, similar to the design of European cars well into the 20th century. Many American passenger trains, particularly the long distance ones, included a car at the end of the train called an observation car. Until about the 1930s, these had an open-air platform at the rear, the "observation platform". These evolved into the closed end car, usually with a rounded end which was still called an "observation car". The interiors of observation cars varied. Many had special chairs and tables. The end platforms of all passenger cars changed around the turn of the 20th century. Older cars had open platforms between cars. Passengers would enter and leave a car through a door at the end of the car which led to a narrow platform. Steps on either side of the platform were used for getting on or off the train, and one might hop from one car platform to another. Later cars had enclosed platforms called vestibules which together with gangway connections allowed passengers not only to enter and exit the train protected from the elements, but also to move more easily between cars with the same protection. Dining cars first appeared in the late 1870s and into the 1880s. Until this time, the common practice was to stop for meals at restaurants along the way (which led to the rise of Fred Harvey's chain of Harvey House restaurants in America). At first, the dining car was simply a place to serve meals that were picked up en route, but they soon evolved to include galleys in which the meals were prepared. The introduction of vestibuled cars, which for the first time allowed easy movement from car to car, aided the adoption of dining cars, lounge cars, and other specialized cars. By the 1920s, passenger cars on the larger standard gauge railroads were normally between 60 ft (18.3 m) and 70 ft (21.3 m) long. The cars of this time were still quite ornate, many of them being built by experienced coach makers and skilled carpenters. In the United States, the so-called "chair car" with individual seating became commonplace on long-distance routes. With the 1930s came the widespread use of stainless steel for car bodies. The typical passenger car was now much lighter than its wood cousins of old. The new "lightweight" and streamlined cars carried passengers in speed and comfort to an extent that had not been experienced to date. Aluminum and Cor-Ten steel were also used in lightweight car construction, but stainless steel was the preferred material for car bodies. Stainless steel cars could be and often were, left unpainted except for the car's reporting marks that were required by law. By the end of the 1930s, railroads and car builders were debuting car body and interior styles that could only be dreamed of before. In 1937, the Pullman Company delivered the first cars equipped with roomettes – that is, the car's interior was sectioned off into compartments, much like the coaches that were still in widespread use across Europe. Pullman's roomettes, however, were designed with a single traveller in mind. The roomette featured a large picture window, a privacy door, a single fold-away bed, a sink and a small toilet. The roomette's floor space was barely larger than the space taken up by the bed, but it allowed the traveller to ride in luxury compared to the multilevel semiprivate berths of old. Now that passenger cars were lighter, they were able to carry heavier loads, but the size of the average passenger that rode in them didn't increase to match the cars' new capacities. The average passenger car could not be made any wider or longer due to side clearances along the railroad lines, but they generally could get taller because they were still lower than many freight cars and locomotives. The railroads soon began building and buying dome and bilevel cars to carry more passengers. Starting in the 1950s, the passenger travel market declined in North America, though there was growth in commuter rail. Private intercity passenger service in the U.S. mostly ended with the creation of Amtrak in 1971. Amtrak took over equipment and stations from most of the railroads in the U.S. with intercity service. The higher clearances in North America enabled a major advancement in passenger car design, bi-level (double-decker) commuter coaches that could hold more passengers. These cars started to become common in the United States in the 1960s, and were adopted by Amtrak for the Superliner design as well as by many other railroads and manufacturers. By the year 2000 double-deckers rivaled single level cars in use around the world. While intercity passenger rail travel declined in America, ridership continued to increase in other parts of the world. With the increase came an increased use of newer technology on existing and new equipment. The Spanish company Talgo began experimenting in the 1940s with technology that would enable the axles to steer into a curve, allowing the train to move around the curve at a higher speed. The steering axles evolved into mechanisms that would also tilt the passenger car as it entered a curve to counter the centrifugal force experienced by the train, further increasing speeds on existing track. Today, Talgo trains are used in many places in Europe and they have also found a home in North America on some short and medium distance routes such as Eugene, Oregon, to Vancouver, British Columbia. Another type of tilting train that is seeing widespread use across Europe is the Pendolino. These trains, built by Fiat Ferroviaria (now owned by Alstom), are in regular service in Italy, Portugal, Slovenia, Finland, Czech Republic and the United Kingdom. Using tilting trains, railroads are able to run passenger trains over the same tracks at higher speeds than would otherwise be possible. Amtrak continued to push the development of U.S.-designed passenger equipment even when the market demand didn't support it, ordering a number of new passenger locomotive and car types in the 1980s and 1990s. However, by the year 2000 Amtrak went to European manufacturers for the Amtrak Cascades (Talgo) and Acela Express trains, their premier services. These trains use new designs and are made to operate as coherent "trainsets". 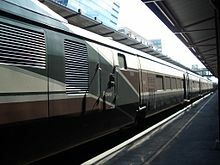 High-speed trains are made up of cars from a single manufacturer and usually of a uniform design (although the dining car on the ICE has a dome). In the 1960s and 1970s countries around the world started to develop trains capable of traveling in the 150–200 mph range, to rival air travel. One of the first was France's TGV which entered service in 1981. By the year 2000, Western Europe's major cities (London, Paris, Brussels, Amsterdam, Geneva, Berlin, Rome, etc.) were connected by high-speed rail service. Often tilting and high-speed cars are left in "trainsets" throughout their service. For example, articulated cars cannot be uncoupled without special equipment because the individual cars share trucks. This gives modern trains a smooth, coherent appearance because all the cars and often the engines share a similar design and paint scheme. A heavyweight car is one that is physically heavier than a lightweight car due to its construction. While early cars used wood construction, Pullman switched to heavyweight riveted steel construction in 1910, more or less at the same time as other rail car manufacturers. Heavyweights are said[by whom?] to offer a more luxurious ride due to their added mass (from the plate steel construction and concrete floor) and, usually, six-wheeled trucks (bogies). The stepped roof line of early heavyweights usually consisted of a center sill section (the clerestory) that ran the length of the car and extended above the roof sides by as much as a foot. This section of the roof usually had windows or shutters that could be opened for ventilation while the train was in motion. However, railroad crews and passengers quickly discovered that when these windows were opened on a passenger train pulled by one or more steam locomotives, smoke and soot from the locomotives tended to drift in through the windows, especially when the train went through a tunnel. In the early 20th century, air conditioning was added to heavyweight cars for the first time. An air conditioned heavyweight car could be spotted easily since the area where the roof vent windows existed was now covered, either partially or in full, by the air conditioning duct. As lightweight cars were introduced, many heavyweight cars were repurposed into maintenance of way service by the railroads that owned them. 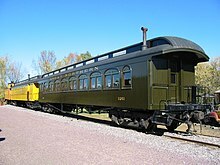 Lightweight passenger cars required developments in steel processing that were not available until the 1920s and 1930s. By building passenger cars out of steel instead of wood, the manufacturers were able to build lighter weight cars with smooth or fluted sides and smooth roof lines. Steel cars were ushered in at the beginning of the streamline era of the 1930s (although not all lightweight cars were streamlined) and steel has continued in use ever since then. With the use of steel for the car sides, railroads were able to offer more innovative passenger car types. Railroads did not build or use dome cars until the first lightweight cars were introduced because the sides of heavyweight cars were not strong enough to support the weight of the dome and its passengers. Lightweight cars also enabled the railroads to operate longer passenger trains; the reduced car weight meant that more passengers could be carried in a greater number of cars with the same locomotives. The cost savings in hauling capacity coupled with the increased car type options led to the quick replacement of heavyweight cars with lightweight cars. Traditionally the passenger car can be split into a number of distinct types. The most basic division is between cars which do carry passengers and "head end" equipment. The latter are run as part of passenger trains, but do not themselves carry passengers. Traditionally they were put between the locomotive and the passenger-carrying cars in the consist, hence the name. Some specialized types are variants of or combine elements of the most basic types. Also, the basic design of passenger cars is evolving, with articulated units that have shared trucks, with double-decker designs, and with the "low floor" design where the loading area is very close to the ground and slung between the trucks. An interior view of a Finnish bilevel coach. The seating arrangement is of the "open" type. Reclining seats in a coach car. The coach is the most basic type of passenger car, also sometimes referred to as "chair cars". In one variant, "open" coaches have a centre corridor; the car's interior is often filled with row upon row of seats like that in a passenger airliner. Other arrangements of the "open" type are also found, including seats around tables, seats facing windows (often found on mass transit trains since they increase standing room for rush hour), and variations of all three. Seating arrangement is typically [2+2], while the hard seat in China has [3+2] arrangements. The seating arrangements and density, as well as the absence or presence of other facilities depends on the intended use – from mass transit systems to long distance luxury trains. Reclining seats, as in the illustration at the left, allow for easier sleeping, for passengers not traveling on a sleeping car. In another variant, "closed" coaches or "compartment" cars have a side corridor to connect individual compartments along the body of the train, each with two rows of seats facing each other. In both arrangements carry-on baggage is stowed on a shelf above the passenger seating area. The opening into the cars is usually located at both ends of the carriage, often into a small hallway – which in railway parlance is termed a vestibule. Earlier designs of UK coaching stock had additional door or doors along their length, some supporting compartmentalised carriages. "Composite" coaches are also known. These are mixed-class cars featuring both open seating and compartments. One such coach is the Composite Corridor, introduced for British Rail in the 1950s; though such coaches existed from early pre-grouping days, at the end of the 19th century. In India normal carriages often have double height seating, with benches (berths), so that people can sit above one another (not unlike a bunk bed), in other countries true double decker carriages are becoming more common. The seats in most coaches until the middle of the 20th century were usually bench seats; the backs of these seats could be adjusted, often with one hand, to face in either direction so the car would not have to be turned for a return trip. The conductor would simply walk down the aisle in the car, reversing the seat backs to prepare for the return trip. This arrangement is still used in some modern trains. A dining car (or diner) is used to serve meals to the passengers. Its interior may be split with a portion of the interior partitioned off for a galley, which is off-limits to passengers. A narrow hallway is left between the galley and one side wall of the car for passengers to use. The remainder of the interior is laid out with tables and chairs to look like a long, narrow restaurant dining room. There are special personnel to perform waitstaff and kitchen duties. Lounge cars carry a bar and public seating. They usually have benches, armchairs or large swivelling chairs along the sides of the car. They often have small tables for drinks, or may be large enough to play cards. Some lounge cars include small pianos and are staffed by contracted musicians to entertain the passengers. These cars are often pulled in addition to the dining car, and on very long trains in addition to one or more snack or café cars. Café cars, such as the Amtrak café cars, are simpler, lacking window-facing seats, instead, rows of tables with facing pairs of bench seats, split by a food and drink counter. Lounge cars are an important part of the appeal of passenger trains when compared to aircraft, buses and cars; there is more space to move around, socialize, eat and drink, and a good view. The observation car almost always operated as the last car in a passenger train, in US practice. Its interior could include features of a coach, lounge, diner, or sleeper. The main spotting feature was at the tail end of the car – some more modern US designs had walls of the car usually curved together to form a large U shape, and larger windows were installed all around the end of the car; earlier designs had square ends with an observation open deck (preserved stock in Southern Africa, Oceania and many countries elsewhere.) Before these cars were built with steel walls, the observation end of heavyweight cars in the US and Canada resembled a roofed porch area. Larger windows were installed at the observation end on these cars as well. At this end of the car, there was almost always a lounge where passengers could enjoy the view as they watched the track rapidly recede into the distance. Often called "sleepers" or "Pullman cars" (after the main American operator), these cars provide sleeping arrangements for passengers travelling at night. Early models were divided into sections, where coach seating converted at night into semi-private berths. More modern interiors are normally partitioned into separate bedroom compartments for passengers. The beds are designed in such a way that they either roll or fold out of the way or convert into seats for daytime use. Compartments vary in size; some are large enough for only a bed, while others resemble efficiency apartments including bathrooms. In China, sleeping cars still serve as major travel classes in long-range rail transport. The classes of sleeping cars include hard sleeper (YW) with six bunks per compartment, soft sleeper (RW) typically with four bunks, deluxe soft sleeper (GRW) typically with two bunks. Although passengers generally were not allowed access to the baggage car, they were included in a great number of passenger trains as regular equipment. The baggage car is a car that was normally placed between the train's motive power and the remainder of the passenger train. The car's interior is normally wide open and is used to carry passengers' checked baggage. Baggage cars were also sometimes commissioned by freight companies to haul less-than-carload (LCL) shipments along passenger routes (Railway Express Agency was one such freight company). Some baggage cars included restroom facilities for the train crew, so many baggage cars had doors to access them just like any other passenger car. Baggage cars could be designed to look like the rest of a passenger train's cars, or they could be repurposed box cars equipped with high-speed trucks and passenger train steam and air connections. A special type of baggage car came equipped with doors on one end to facilitate transport of large pieces of equipment and scenery for Broadway shows and other productions. These "theatrical" baggage cars were assigned theatrical names (i.e. Romeo and Juliet), and were similar to the "horse cars" that were used to transport racehorses. Express cars carried high-value freight in passenger consists. These cars resembled baggage cars, although in some cases specially-equipped box cars or refrigerator cars were used. Specialized stock cars were used to transport horses and other high value livestock as part of passenger consists. Similar equipment is used in circus trains to transport their animals. In some countries, such as Russia, convicts are transported from court to prison or from one prison to another by railway. In such transportation a specific type of coach, prisoner car, is used. It contains several cell compartments with minimal interior and commodities, and a separate guard compartment. Usually the windows are of nontransparent opaque glass to prevent prisoners from seeing outside and determine where they are, and windows usually also have bars to prevent escapes. Unlike other passenger cars, prisoner cars do not have doors at the ends of the wagon. Like baggage cars, railway post office (RPO; US term) cars or travelling post offices (TPOs; British term) were not accessible to paying passengers. These cars' interiors were designed with sorting facilities that were often seen and used in conventional post offices around the world. The RPO is where mail was sorted while the train was en route. Because these cars carried mail, which often included valuables or quantities of cash and checks, the RPO staff (who were employed by the postal service and not the railroad) were the only train crews allowed to carry guns. The RPO cars were normally placed in a passenger train between the train's motive power and baggage cars, further inhibiting their access by passengers. A colonist car or emigrant car was a special sleeping car designed to take immigrants from ocean ports to settlement areas in western North America at the cheapest possible fare. They offered simple sleeping berths and a cooking area for immigrants who were expected to bring their own food and bedding. A combine is a car that combines features of a head-end and a regular passenger car. The most common combination is that of a coach and a baggage car, but the combination of coach and post office car was also common. Combines were used most frequently on branch lines and short line railroads where there wasn't necessarily enough traffic to economically justify single-purpose cars. As lightweight cars began to appear on railroads, passenger cars more frequently combined features of two or more car types on one car, and the classic heavyweight combine fell out of use. A control car (also known as a "driving trailer" in Europe and the UK) is a passenger car which lets the train be run in reverse with the locomotive at the back. It is common on commuter trains in the US, Canada and Europe. This can be important for serving small towns without extensive switching facilities, dead-end lines, and having a fast turnaround when changing directions in commuter service. A dome car can include features of a lounge car, dining car, and an observation car. Within the United States, the primary manufacturers were The Budd Co. (Stainless Steel construction), The Pullman Co (Steel construction), and ACF (American Car & Foundry. Aluminum construction). A portion of the car, usually in the center, is split between two levels, with stairs leading both up and down from the train's regular passenger car floor level. The lower level of the dome usually consisted of a small lounge area, while the upper portion was usually coach or lounge seating within a "bubble" of glass on the car's roof. Budd Co. dome cars used curved class, whereas Pullman company cars used flat panels of glass that were positioned at different angles above the roofline. Passengers in the upper portion of the dome were able to see in all directions from a vantage point above the train's roof line. On some dome cars, the lower portion was built as a galley, where car attendants used dumbwaiters to transfer items between the galley and a dining area in the dome portion of the car (within the US, the Union Pacific, prior to Amtrak, was the primary owner/user of 'dome dining cars.') . Some dome cars were built with the dome extending the entire length of the car (a 'full dome' car), while others had only a small observation bubble. There were also combination dome-observation cars built which were meant to be the last car on the train, with both rear observation and the dome up top. Dome observation cars came in both round end, and square end versions. The Union Pacific, in the US, was the primary user of square end observation cars, prior to Amtrak, although the Burlington Route had several square end cars of stainless steel. As passenger car construction improved to the point where dome cars were introduced, some passenger car manufacturers began building double decker passenger train cars for use in areas that are more heavily populated or to carry more passengers over a long distance while using fewer cars (such as Amtrak's Superliner cars). Cars used on long-distance passenger trains could combine features of any of the basic car types, while cars used in local commuter service are often strictly coach types on both levels. Double decker coaches were tried in the UK (SR Class 4DD) but the experiment was unsuccessful because the restricted British loading gauge resulted in cramped conditions. Drovers' cars were used on long distance livestock trains in the western United States. The purpose of a drovers' car was to accommodate the livestock's handlers on the journey between the ranch and processing plant. They were usually shorter, older cars, and equipped with stove heaters, as no trainline steam heating was provided. A variety of hospital trains operate around the world, employing specialist carriages equipped as hospital wards, treatment rooms, and full-scale operating theatres. Narragansett-style excursion cars are open-air passenger cars with cross-bench seating first popularized by rail lines in New England. Current operating examples of these train cars can be found on the Disneyland Railroad in California and on the Walt Disney World Railroad in Florida. Similar coaches are also found on the Western River Railroad in Tokyo Disneyland. Many countries historically used special railroad cars to transport prisoners. The tradition is now extinct anywhere except for the post-Soviet countries where dedicated cars (modified sleeping cars) continue to be routinely used for that purpose. Real Soviet prisoner cars and respective procedures was may be seen in The Guard and several other crime-related films. A heavyweight Pullman "business car"
Many cars built by Pullman and other companies were either originally built or later converted for use as business and private cars which served as the "private jet" of the early-to-mid-20th century. They were used by railroad officials and dignitaries as business cars, and wealthy individuals for travel and entertainment. There are various configurations, but the cars generally have an observation platform and include a full kitchen, dining room, state rooms, secretary's room, an observation room, and often servant's quarters. A number of these private cars have survived the decades and some are used for tour rides, leasing for private events, etc. A small number of private cars (along with other types of passenger cars), have been upgraded to meet current Amtrak regulations, and may be chartered by their owners for private travel attached to Amtrak trains. The only current example in Britain is the British Royal Train. A "troop sleeper" was a railroad passenger car which had been constructed to serve as something of a mobile barracks (essentially, a sleeping car) for transporting troops over distances sufficient to require overnight accommodations. This method allowed part of the trip to be made overnight, reducing the amount of transit time required and increasing travel efficiency. Troop kitchens, rolling galleys, also joined the consists in order to provide meal service en route (the troops took their meals in their seats or bunks). Troop hospital cars, also based on the troop sleeper carbody, transported wounded servicemen and typically travelled in solid strings on special trains averaging fifteen cars each. Passenger cars are as almost as old as railroading itself, and their development paralleled that of freight cars. Early two axle cars gave way to conventional two truck construction with the floor of the car riding above the wheels; link and pin couplers gave way to automatic types. Several construction details characterized passenger equipment. Passenger trains were expected to run at higher speeds than freight service, and therefore passenger trucks evolved to allow superior ride and better tracking at those speeds. Over time, in most cases provision was made for passengers and train staff to move from car to car; therefore platforms and later vestibules were used to bridge the gap. In later years a number of changes to this basic form were introduced to allow for improvements in speed, comfort, and expense. Articulated passenger cars are becoming increasingly common in Europe and the US. This means that the passenger cars share trucks and that the passageways between them are more or less permanently attached. The cars are kept in "trainsets" and not split up during normal operations. Articulated cars have a number of advantages. They save on the total number of wheels and trucks, reducing costs and maintenance expenses. Further, movement between cars is safer and easier than with traditional designs. Finally, it is possible to implement tilting schemes such as the Talgo design which allow the train to lean into curves. The chief disadvantage is that failure of a single car disables the entire set, since individual cars cannot be readily switched in and out of the consist. In some countries (such as the US), platform level may be below the level of the floor of passenger cars, resulting in a significant step up from platform level – leading to slower boarding times, which are important for high-capacity systems. Low-floor cars have their main passenger and loading floor directly on level with the loading platform, instead of having a step up to the passenger compartment as was traditional until around the 1970s. This is achieved by having a low-slung chassis with the "low floor" resting between the trucks, rather than resting completely on top with a simpler straight chassis design. This improved design is seen in many passenger cars today, especially double decker cars. The low floor enables easy access for bicycles, strollers, suitcases, wheelchairs and those with disabilities, which is otherwise not always convenient or even possible with the traditional passenger car design. Within the United States, the Pennsylvania Railroad developed 'The Keystone' 7 car set of cars with their own attached (head end) power car in the late 1950s. It was mostly used between New York City and Washington, DC. Boarding was at the normal platform level, at the end of the cars, with the center section between the trucks lowered to give the cars a lower center of gravity, and higher speed capability. These vehicles usually carry motive power in each individual unit. Trams, light rail vehicles and subways have been widely constructed in urban areas throughout the world since the late 19th century. By the year 1900, electric-powered passenger cars were ubiquitous in the developed world, but they fell into decline after World War II, especially in the U.S. By the year 2000 they had regained popularity and modern lines were being rebuilt where they had been torn up only 40 years earlier to make way for automobiles. On lighter-trafficked rural railways, powered diesel cars (such as the Budd Rail Diesel Car) continue to be popular. In Germany, the new Talent design shows that the diesel-powered passenger car is still a viable part of rail service. In the UK, locomotive-hauled passenger trains have largely been replaced by diesel multiple units, such as the Bombardier Voyager family, even on express services. These cars are able to tilt to counter the effects of inertia when turning, making the ride more comfortable for the passengers. Amtrak has adopted Talgo trainsets for its Amtrak Cascades service in the Pacific Northwest. Other manufacturers have also implemented tilting designs. The British Rail Class 390 is a tilting train operating in the UK. While some railroads, like the Milwaukee Road, preferred to build their own passenger cars, several railcar manufacturers built the majority of passenger cars in revenue service. Most of these companies produced both passenger and freight equipment for the railroads. This is by no means a comprehensive list of all passenger car builders (see List of rolling stock manufacturers for a more complete list). Quite a large number of firms built passenger cars over the years, but the majority of cars in the 20th century were built by these companies. American Car and Foundry was formed in 1899 through the merger of 13 smaller railroad car manufacturing companies (in much the same way as the American Locomotive Company was formed from the merger of 8 smaller locomotive manufacturers two years later in 1901). ACF built the first all-steel passenger car in the world for Interborough Rapid Transit in 1904, and then built the first steel cars used on the London Underground in the following year. The company continued to manufacture passenger equipment until 1959. ACF still manufactures freight cars today. Bombardier is the largest manufacturer of passenger cars in the world. This company started in Canada and has become multi-national, making everything from passenger cars to commuter aircraft in factories around the world. The Budd Company got its start in the early 1930s when Edward G. Budd developed a way to build carbodies out of stainless steel. In 1932 he completed his first railcar, dubbed the Green Goose. It used rubber tires and a stainless steel body, and was powered by the engine out of Budd's own Chrysler Imperial automobile. Budd sold a few of these early powered cars to the Reading Railroad, Pennsylvania Railroad and the Texas and Pacific Railway. The next year, Ralph Budd, only a very distant relation, but president of the Chicago, Burlington and Quincy Railroad at the time, came to Budd to build the Pioneer Zephyr. Budd was soon called on by another railroad president before the end of the decade. Samuel T. Bledsoe asked Budd to build the new lightweight cars for the Santa Fe's new Super Chief passenger train. Budd continued building lightweight powered and unpowered cars through the 20th century for nearly every major railroad in North America. This included some of the Metroliners, for use between New York City and Washington, DC, as well as the Amfleet I coaches, lounges, and café cars of the early 1970s. Kawasaki has been manufacturing passenger rail cars at its facility in Lincoln, Nebraska, since 2001. Kawasaki's Lincoln plant has manufactured rail cars for MBTA, NYCT, PATH, MNR with cars that have led the way with the industry's best MTBF (Mean Time Between Failures). Kawasaki Rail Car was the first American rail car manufacturer to achieve the International Organization for Standardization ISO-9002 certification. The most famous of all the car manufacturers was Pullman, which began as the Pullman Palace Car Company founded by George Pullman in 1867. The Pullman Palace Car Company manufactured railroad cars in the mid-to-late 19th century through the early decades of the 20th century during the boom of railroads in the United States. Pullman developed the sleeping car which carried his name into the 1980s. In 1900, the Pullman Palace Car Company was reorganized as The Pullman Co.. In 1924, Pullman Car & Manufacturing Co. was organized from the previous Pullman manufacturing department to consolidate the car building interests of The Pullman Co. In 1934, Pullman Car & Manufacturing merged with Standard Steel Car Co. to form the Pullman-Standard Car Manufacturing Company, which remained in the car manufacturing business until 1982. Pullman manufactured its last cars for Amtrak in 1981. The last car built and delivered at the end of July 1981 was named George Mortimer Pullman in honor of the company's founder. Siemens was founded in 1847 in Berlin, Germany building Conglomerates, Electric and Industry products, Healthcare Radioative systems, rolling stock, etc. The Siemens "Viaggio" passenger car models are to all purposes in the European railways: Viaggio Twin: double-deck coaches used on CityNightLine and ÖBB CityShuttle regional trains; Viaggio Classic: Original Siemens passenger cars, similar to Eurofima UIC cars, used in Germany, Greece, Czech Republic and Austria; Viaggio Light: new low-floor regional passenger coaches now used in Israel and Viaggio Comfort: New luxury articulated coaches used on ÖBB's railjet and Siemens Coach 2000 prototype lounge car. Founded in April 1887, in its namesake city, St. Louis Car Company manufactured railroad cars for streetcar lines (urban passenger railways) and steam railroads. The company made brief forays into building automobiles and aircraft, but they are best known as the manufacturers of Birney and PCC streetcars which have seen worldwide use. St. Louis Car Company closed in 1973. The earliest form of train lighting was provided by Colza oil lamps. The next stage was gas lighting, using compressed gas stored in cylinders under the coaches. Finally, electric lighting was introduced. Early railway coaches had no heating but passengers could hire foot-warmers. These worked on the same principle a modern sodium acetate heating pads. Later, steam heating was introduced, using a steam supply from the steam locomotive. Steam heating continued into the diesel locomotive era, with steam supplied by a steam generator. Now, electric heating is almost universal and air-conditioning is often provided as well. In the case of diesel multiple units, the coaches may be heated by waste heat from the engines, as in an automobile. In a subway car, tram or train, an insulator at a track switch may cut off power from the car for a few feet along the line and use a large capacitor to store energy to drive the subway car through the insulator in the power feed. Annie and Clarabel are a pair of anthropomorphic carriages usually pulled by Thomas the Tank Engine. Double decker train – Many coaches were and are built as bilevel (double-decker) cars, such cars are operated by commuter railways in many large cities in North America as well as on commuter and mainline trains in Europe. ^ "Oxford Learner's Dictionaries – Find definitions, translations, and grammar explanations at Oxford Learner's Dictionaries". www.oxfordadvancedlearnersdictionary.com. ^ White 1985b, pp. 466–472. ^ a b Broggie (2014), p. 251. ^ Broggie (2014), p. 331. ^ "An Introduction To Capacitors". www.facstaff.bucknell.edu. Ellis, Hamilton (1968). The pictorial encyclopedia of railways. Hamlyn Publishing Group. ISBN 0-600-03075-X. Kratville, William W. (1962). Steam Steel and Limiteds. A Saga of the Great Varnish Era. Omaha, NE: Barnhart Press. OCLC 1301983. Mencken, August (2000) . The railroad passenger car: An illustrated history of the first hundred years with accounts by contemporary passengers. Johns Hopkins University Press, Baltimore, MD. ISBN 0-8018-6541-7. Welsh, Joe (2005). "New deal for rail travel". Classic Trains Special Edition. No. 3, Streamliner Pioneers. pp. 8–17. ISSN 1541-809X. White, John H. (1985) . The American Railroad Passenger Car. 1. Baltimore, Maryland: Johns Hopkins University Press. ISBN 978-0-8018-2722-8. White, John H. (1985) . The American Railroad Passenger Car. 2. Baltimore, Maryland: Johns Hopkins University Press. ISBN 978-0-8018-2747-1. Wikimedia Commons has media related to Railway coaches. Look up Passenger car in Wiktionary, the free dictionary.